Are Fireworks Meaningless Without Music? In the town I grew up in, going to the fireworks on the green was like the social event of the year. Everyone in town was there. The parents and neighbors went a little earlier with their coolers. The little kids all had those buzzy light up things swirling around, while all the big kids walked around just “hanging out” before sitting with their family in time for the big show. There was a band playing background music in the gazebo up until the lights went out and the fireworks were about to start. As soon as the first bang lit up the sky, songs like God Bless the U.S.A. and Born in the U.S.A. started pumping out of the speakers. Since I moved to East Haven fireworks just haven’t been the same. I traded the bustle and charm of the Hamden fireworks to stand by the beach and watch multiple towns’ firework shows along the coastline. While I get to see more fireworks, I have found they lost part of their meaning. 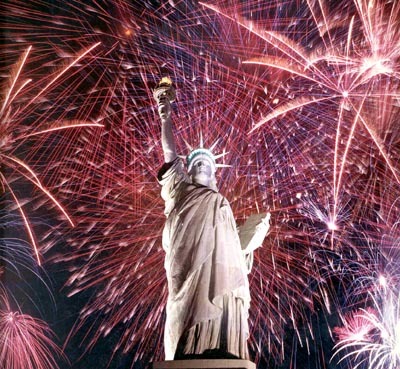 I always thought that it was the whole experience that made fireworks so important to the Fourth of July. The beauty of the fireworks paired up with the dramatic music filled with pride of our country and the sacrifices made to maintain our way of life were what the Fourth of July are all about, but without that music fireworks are just… well… pretty. Don’t get me wrong, I enjoy looking at fireworks as much as the next person, but they just do not hold meaning on their own. I think that is why I enjoy the Disney firework shows so much. The music and story around them is captivating. And that is how I remember Fourth of July fireworks being, so every year seems to be a disappointment when that magic does not come through. So for those of you watching fireworks from a distance and cannot hear the music, here are some of my favorite Fourth of July jams.